David Walliams’ Mr Stink is almost genetically engineered to appeal to children. At one point in Lou Stein’s adaptation the titular homeless man lets out a ferocious burp to scare off the person bullying his young friend Chloe Crumb and the Chickenshed’s audience erupted in delighted disgust. Despite the considerable length of this production, the enthusiasm barely flags onstage or off. Though it could have been condensed for a more manageable experience, the show includes multiple appearances by Walliams’ crossover character, the shop owner Raj (a playful Goutham Rohan), 11 original songs set to music by Dave Carey and launched into at a moment’s notice, and a huge amount of dialogue. Chickenshed’s unique dedication to inclusion provides the production with a well-choreographed chorus of colourful neighbours for the Crumb family made up of current students and staff members alike, not to mention the stage debut of Jeremy Vine – via projector. 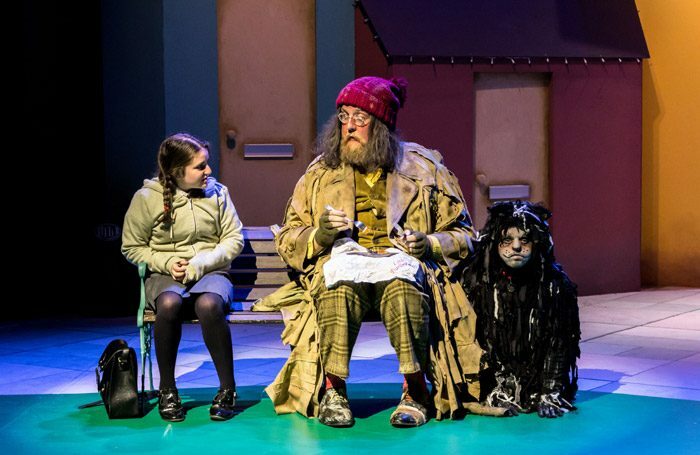 Bradley Davis’ Mr Stink is polite and likeable to a fault regardless of his smell, while Lucy-Mae Beacock, convinces as a bright and forthright Chloe, struggling with her sniffy mother (Belinda McGuirk) and pushover father (Ashley Driver). Of course, both parents undergo extremely rapid last minute changes of heart. Beacock’s singing is charmingly clear, but there are audibility problems throughout: though the actors have microphones, the uninspired recorded backing music often drowns them out. Keith Dunne’s costuming is faithful to the book but the depth of the set makes hearing the actors harder by distancing them from the audience.